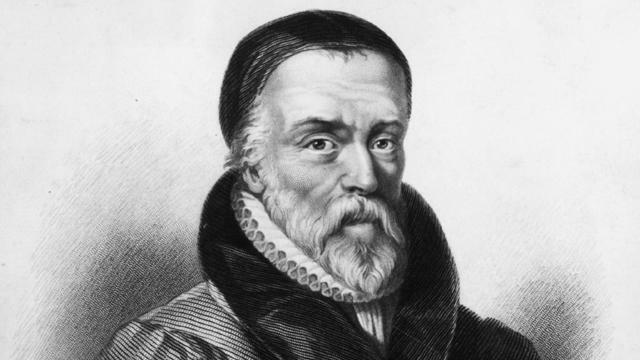 William Tyndale, an English scholar and leading figure in Protestant reform in the years leading up to his execution. He translated the Bible into English and the spread of Wycliffe's Bible resulted in a death sentence for any unlicensed possession of Scripture in English. Tyndale's translation was the first English Bible to draw directly from Hebrew and Greek texts, the first English one to take advantage of the printing press, and first of the new English Bibles of the Reformation. In 1535 Tyndale was arrested and jailed. In 1536 he was convicted of heresy and executed by strangulation, after which his body was burnt at the stake. His dying prayer that the King of England's eyes would be opened. Two years later, with Henry's authorisation, the Great Bible for the Church of England was published, this was based largely Tyndale's work. In 2002, Tyndale came in at number 26 in the BBC's poll of the 100 Greatest Britons.